Maya Stovall, Liquor Store Theatre, 2014-2016. 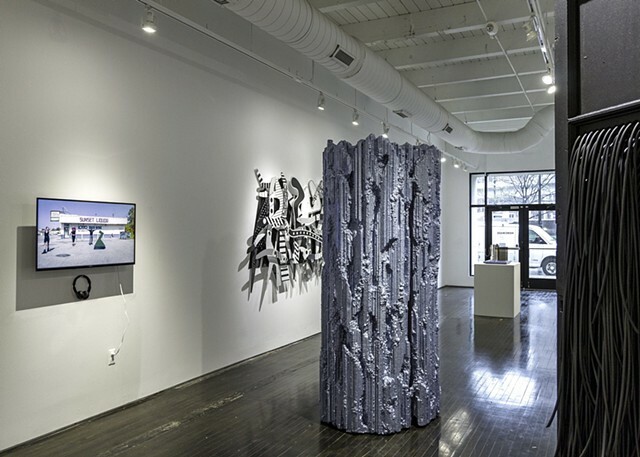 Installation view, 2017 Biennial exhibition. Photograph by Ron Amstutz. 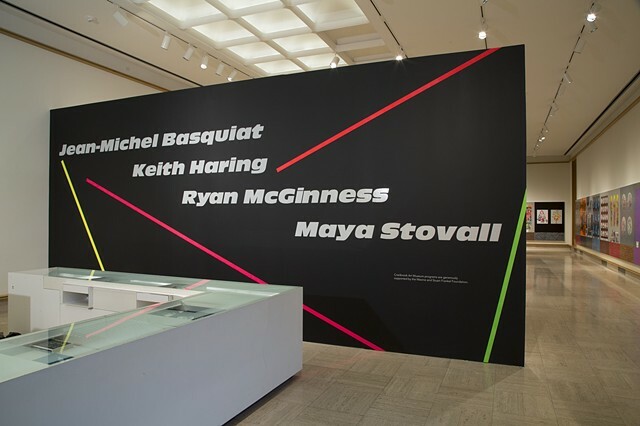 Partial installation view, Maya Stovall: Under New Ownership, solo exhibition, jointly presented by Fort Mason Center for Arts & Culture & San Francisco Art Institute, San Francisco, Calif. curated by Frank Smigiel. Installation photograph courtesy Pei Ketron & Fort Mason Center for Arts & Culture. The artist with her Untitled D1 & Untitled D2 (2019) works. 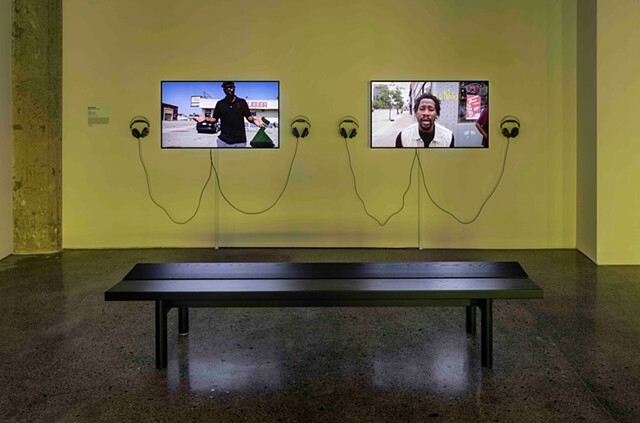 Photograph courtesy Pei Ketron & Fort Mason Center for Arts & Culture. Maya Stovall, Liquor Store Theatre, vol. 4, no. 7 (2017), (l monitor). 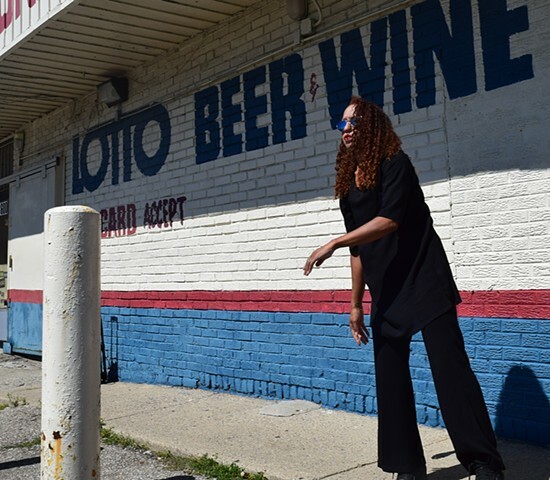 Maya Stovall: Liquor Store Theatre, vol. 2, no. 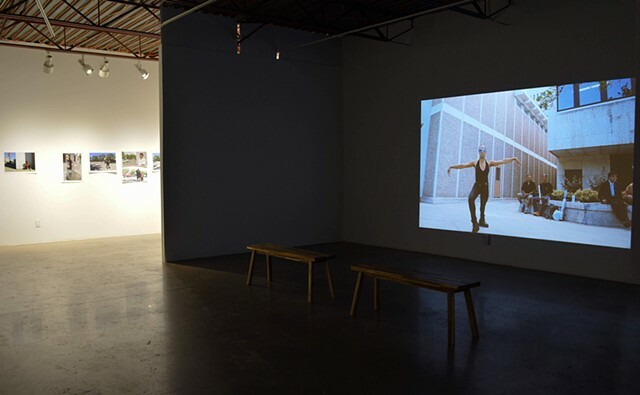 2 (2015), (r monitor), installation view, BELIEVE, curated by David Liss. 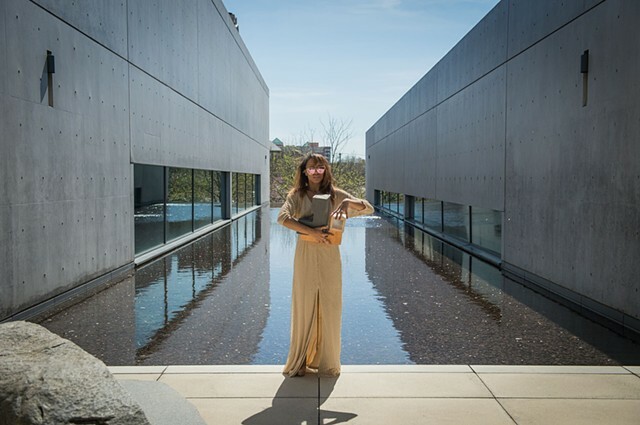 Photograph courtesy Museum of Contemporary Art Canada. Maya Stovall, Untitled A, 2017. 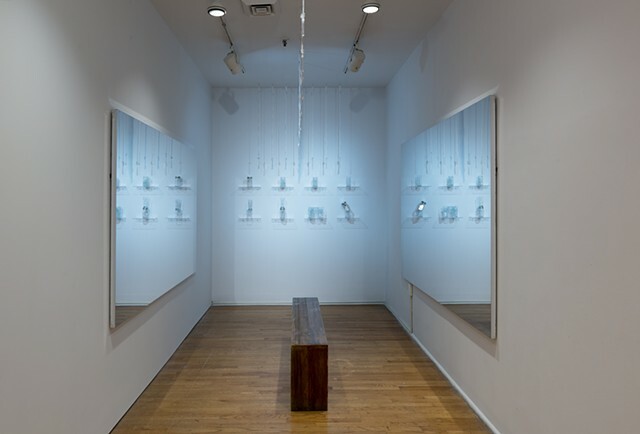 Installation view, 2017 Fictions Exhibition. Photograph courtesy The Studio Museum in Harlem. 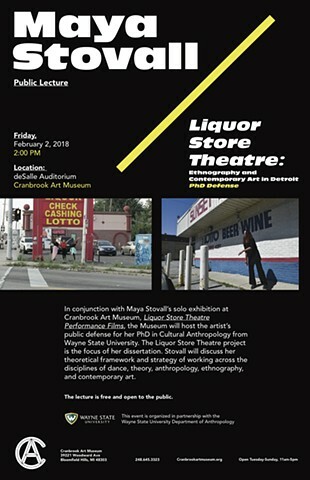 Installation view including Maya Stovall, Liquor Store Theatre, vol. 4, no. 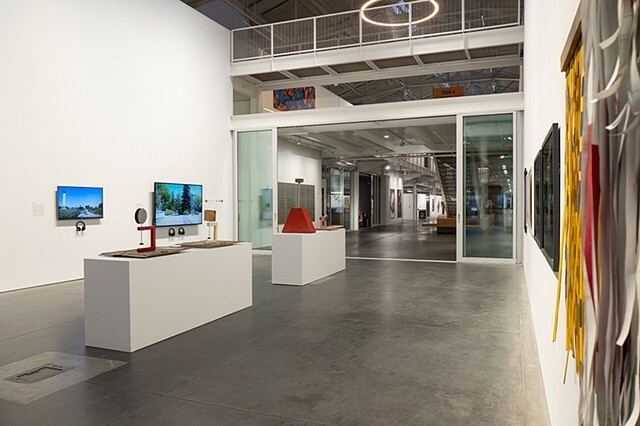 7 (2017) (monitor at left) in Homemade, curated by McArthur Binion. Installation image courtesy Library Street Collective. 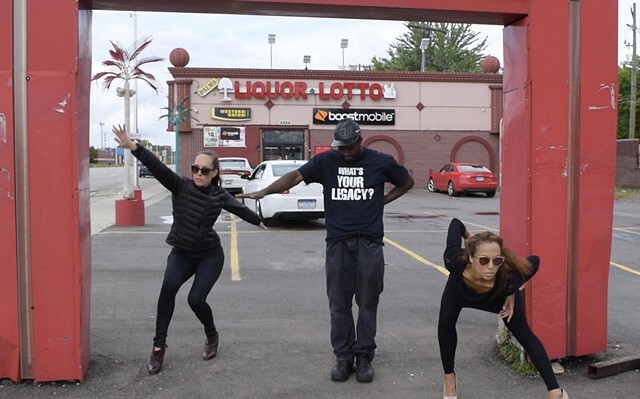 Maya Stovall: Liquor Store Theatre Performance Films photograph by P.D. Rearick and courtesy Cranbrook Art Museum. Curated by Laura Mott. 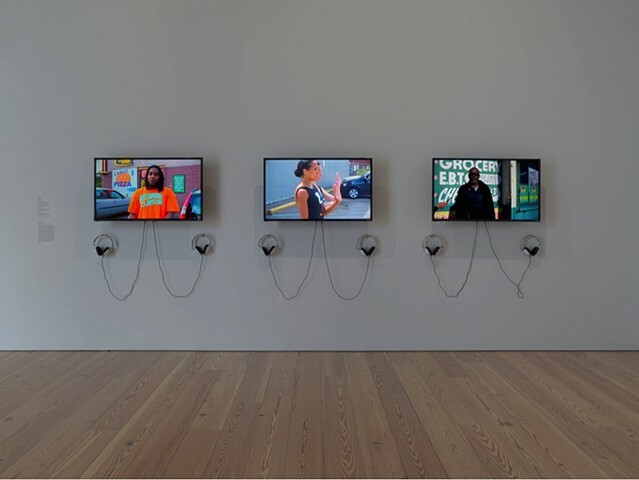 ARTFORUM: "Maya Stovall's videos are not about voyeurism; rather, they attempt to channel the many spirits of a city unseen"
Mohamed Soumah and Maya Stovall in performance of Maya Stovall: Manifesto, at the Whitney Museum of American Art, New York City, May 17, 2017. Photograph copyright Paula Court. 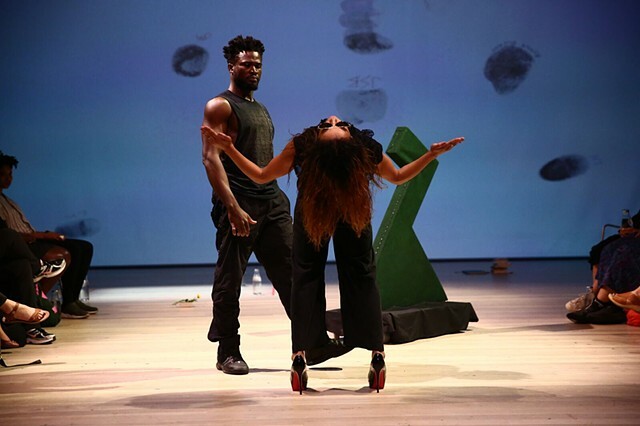 MANIFESTO is a new performance by 2017 Whitney Biennial artist Maya Stovall. 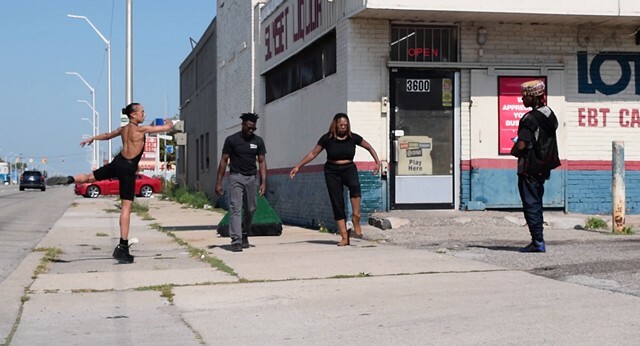 Working with collaborators Biba Bell, Mohamed Soumah, and Todd Stovall, the artist presents an evening of chance encounters through which she explores the motivations, genealogies, and sources of her Liquor Store Theatre. Michael Stone-Richards (MSR) and Maya Stovall talk about Thinking Place; and discuss works of James Boggs and Adrian Piper. 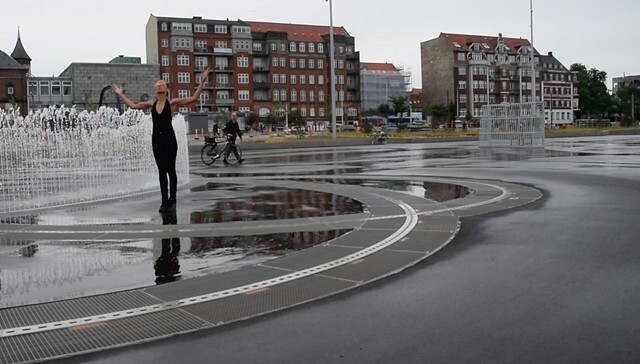 A performance installation at the American Association of Anthropologists (AAA) Annual Meeting. 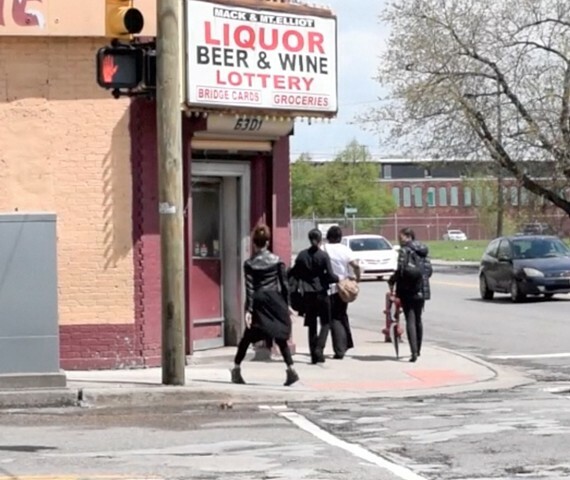 The Detroit News: Maya Stovall's is 1 of 4 CAM exhibitions "that straddle both the studio and the gritty street"
Matthew Piper, Essay'd: One of artist Maya Stovall’s primary interlocutors is the City—that ever-shifting concatenation of street, sidewalk, and neighborhood; of people, power, and capital. 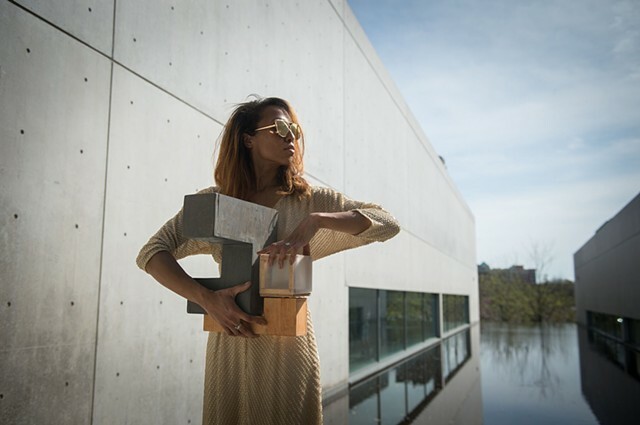 ArtNet: The Whitney Biennial includes artists doing work across the gamut—from studio-based practices to literally doing performances out in the street, like Maya Stovall—who are all thinking about what is happening right now in society, and in the US. Art News: Here Is the 2017 Whitney Biennial List!